Abby Jaros '14 discusses her experience as a cast member in the hit musical that's currently captivating audiences in downtown Orlando. 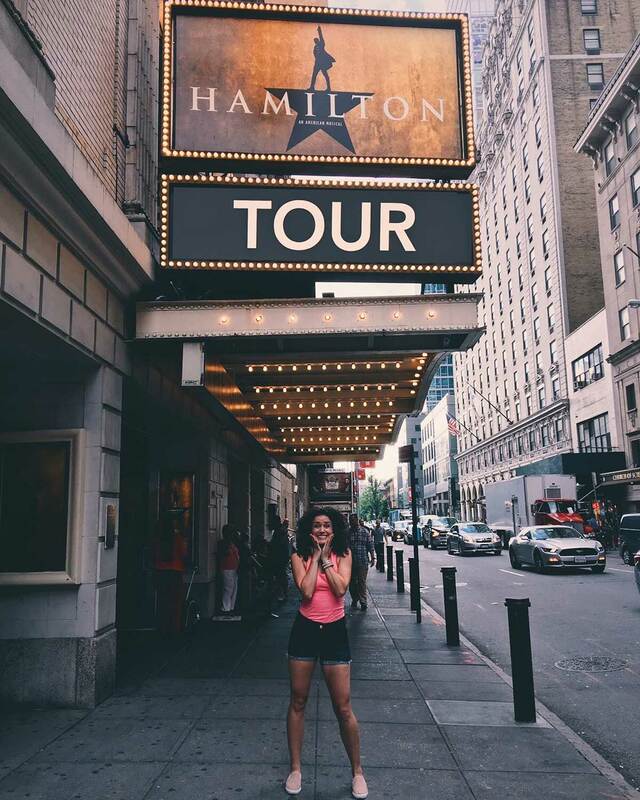 Abby Jaros '14 has spent the last year touring with hit musical Hamilton, which is now playing at the Dr. Phillips Center for the Performing Arts until Feb. 10. Abby Jaros ’14’s eyes light up the instant she steps into UCF’s theatre building and spots three red dresses on display in the corner. The musical theatre alumna takes a moment to appreciate her reunion with the costumes she wore five years ago as the lead in a UCF production of Kiss of the Spider Woman before she sits down to talk about her current role in the cultural phenomenon Hamilton. She moved to New York immediately after graduation to pursue her Broadway dreams. So while she always imagined this for herself, she says she sometimes still can’t believe she is out on stage every night in the biggest musical in America now. 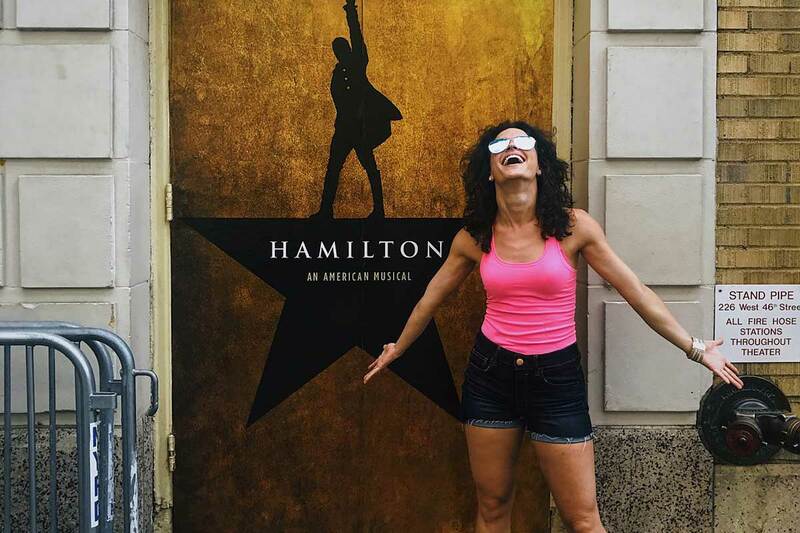 Jaros recently celebrated her one-year anniversary with the U.S. tour of Hamilton, which is playing at the Dr. Phillips Center for the Performing Arts in downtown Orlando until Feb. 10. You auditioned for the show nine times before getting your role as Woman One. Did you always feel it was going to work out eventually? I was holding onto that hope. I had gotten some reinforcement from the creatives I was working with in the audition process. They were giving a lot of great feedback. I was thankfully on a first-name basis with some of them. Things don’t happen for a reason in certain places and that’s just how life is. My friend, Phil Colgan, who is also on the tour with me, found out the same day I did. He texted me that night, “I have something to tell you.” I said, “We should get drinks this week because I have something to tell you, too.” The next day he called me and he’s like, “No. I have something to tell you.” We had to keep it a secret for six months until they were ready to announce it. Anytime he and I saw a Hamilton poster, we took a picture with it and thought, one day we can share this. It was hard to keep it a secret because I am someone who is in auditions every day. When people stop seeing you at those or stop seeing you on that grind, they say, “Wait a minute, what’s happening?” You have to play dumb to it, and that was very hard. I’m Woman One. She’s sassy. She’s fun. You have to be able to do all things that I’ve studied my whole life and at this institution. You have to be able to act through dance and song. I’m singing soprano, so I’m singing the highest track on the show and still dancing a lot. I really get a fulfillment of all the areas. And you’re doing all that while wearing a corset. What’s that like? We do have a vest we have for a couple of the larger dance numbers, but we still dance a lot in the corset. I don’t even know if I can explain it. There are times that even though my arms aren’t tied down, I feel like I’m in a straightjacket because I can only move certain parts. We have to dance with it, and we have to make it look easy. I’ve definitely gained a serious core dancing in one. That’s for sure. How does the experience compare to your expectations when you first got the gig? I knew there was a big following with the show but until you’re in it, you don’t realize how much you’re in the spotlight all the time. And I’m in the ensemble, I’m not even some of the people who get recognized from the show. It really does become your 24/7 life. I’m very grateful for that, but it definitely was more intense than I had realized. Why do you think Hamilton resonates with so many people? To me, there are multiple reasons. I was never very good at history, but putting it to music and dance, OK now I get it. I think that’s the answer for a lot of people. I also think with the representation of different colors and sizes on our stage, it represents America and what people see in the people who were the founding fathers of our country and building this big thing we have now. I think it gives a lot of hope to people. It just is revolutionary in the musical theatre world. There are just so many answers to that. And I’m still finding more and more answers to that all the time, especially when fans come up to you at the stage door and say, “This resonated with me today.” There are so many times Hamilton was shot down, but he never gave up. I think that is a huge theme we can learn from this. What is your day-to-day routine like? We get to sit down in places for a while and really get to know areas of the country that we’re performing in, which is amazing. We have eight shows a week, and five of them are on the weekend, which can be intense. It’s a lot of Hamilton in three days. Our cast rallies through that. Mondays are the days to explore and live your life. I’ve had to learn to build a schedule because being on the road and living out of a suitcase is tough. I go to the grocery store and meal prep for the week. I usually work out Wednesdays through Fridays. There’s still life stuff going on. Taxes are coming up, so I’m dealing with that. I’m constantly striving to keep my personal life and my professional/career life balanced. What has helped keep your life balanced? My dog Ernie. 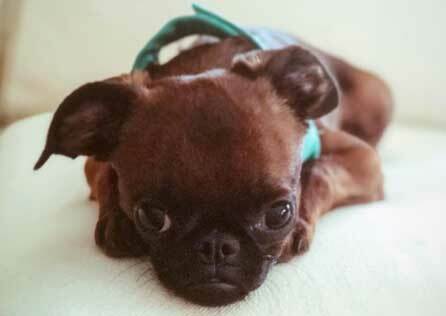 He is a Brussels Griffon, and he has an Instagram (@LilErnieBigJourney). I got him four months ago. I think there are actually about eight dogs on our tour with us. A lot of us have gotten them in the last few months. I was in a little bit of a slump personally. It can get lonely on the road, and I was trying to figure out what I could do. I did a lot of research and talked to a lot of people, especially people on the road who were making it work. If I was going to bring in another life into my life, I needed to make sure I was going to be able to be responsible for it. He has been the best little addition. He is known around town every city we go to. He’s a ham. And it’s led to meeting a lot of cool people. I was at the dog park yesterday for two hours and met a lot of local people and just got to chat with them. It’s so great. He’s brought a lot of happiness to me. What have been some of your favorite experiences away from the stage in the cities you’ve visited? What is really cool about being on this show is a lot of people know about it so they want to show us their world. They are so gracious to give us their time and invite us for VIP tours. When we were in Durham we got to go to the Duke Lemur Center. We’ve done Anecestry.com headquarters in Salt Lake City. With Ernie, now I get to walk more and experience the culture. It was a part of my life on the road that I didn’t explore until I had him. It’s great to walk around and see different shops and meet people and talk to people. Every place has its own trademark. Abby Jaros auditioned for Hamilton nine times before earning a spot on the U.S. Tour.